Everton took a giant step towards the knockout stages of the FA Women’s Super League Continental Tyres Cup with a 4-0 win over Oxford United. 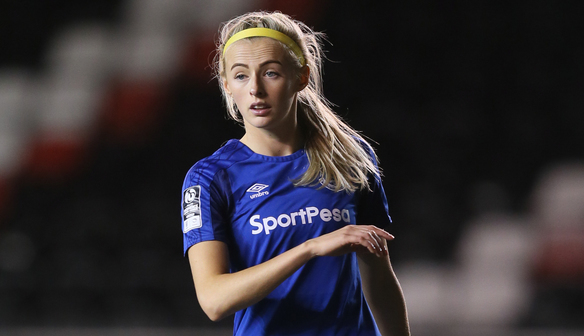 A hat-trick from Chloe Kelly and a second-half strike from Claudia Walker secured the win for Andy Spence’s side, who could have their fate in Group Two North confirmed after Manchester City Women take on Birmingham City Ladies on December 3 – a win for the former would send the Toffees through. The hosts dominated the opening half and took just 10 minutes to take the lead through Kelly. A long ball forward from defence was flicked on by Simone Magill and Kelly powered a half-volley past Demi Lambourne from just inside the area. Walker almost doubled the hosts’ lead four minutes later but she fired just wide from Angharad James’ low right-wing cross. Oxford had a half-chance to equalise on 41 minutes but Dan Carlton’s long-range free-kick dropped just wide of the post. The hosts continued to control possession after the break, with Kelly, Walker and Courtney Sweetman-Kirk causing problems in attack, but the Oxford defence stood firm and looked to pose a threat on the counter-attack. Everton finally broke the Oxford resistance on 69 minutes as Walker calmly slotted home from substitute Jodie Brett’s neat through ball. The hosts extended their lead on 81 minutes as Kelly found space on the edge of the area and powered an effort past Lambourne. And Kelly sealed her hat-trick three minutes later from the penalty spot after Hannah Short brought down Walker. Oxford United’s Hannah Short said: “The main aim was to try and come out and play football and to be fair to us, we did that. Maybe we overplayed at times and they nicked the ball in crucial areas and got in behind. “To be fair to Everton, they’ve got a great squad, with great movement, and they scored their goals off that. Everton hat-trick hero Chloe Kelly said: “I'm very happy with a hat-trick and a great team performance, particularly in the second half. “This is my first senior hat-trick, so I am very happy. “I was confident in the second half that if we showed our quality in possession and were patient, the chances would come.